WOULD YOU LIKE TO TRIPLE YOUR BLOG TRAFFIC? HOW ABOUT YOUR PAGE VIEWS? LET ME SHOW YOU how i did it in 3 weeks! 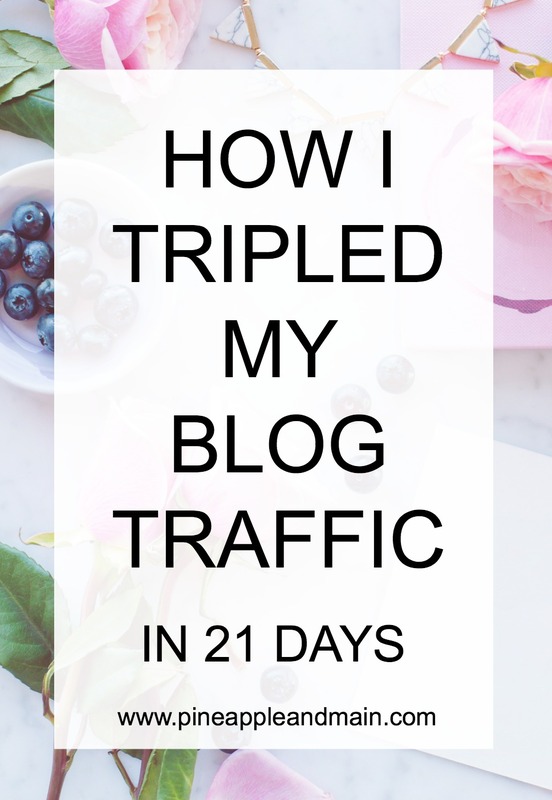 Grab my free download to learn exactly what i did to TRIPLE MY BLOG TRAFFIC! For several months, I set a personal goal to increase my blog traffic. At first, things were progressing rather slowly. Through many hours of research and trial-and-error, I came up with several strategies that really increased my traffic. I saw improvement slowly at first, then more rapidly, then all of a sudden, my blog traffic really took off, resulting in a three-fold increase over 3 weeks. I was shocked! When I realized that this strategy actually worked, I simply repeated it over and over, and every time, my traffic increased by leaps and bounds. Let me help you explode your blog traffic and page views by applying these strategies to your blog with my free download that shows you EXACTLY what I did. Great! Now check your email and get your free download which will show you exactly how I TRIPLED my blog traffic in 21 days! © Copyright 2019 pineappleandmain. All rights reserved.